Land rights play an essential role in agricultural development and inclusive growth, but in many countries like Guinea Bissau, women often lose our due to legal and cultural barriers. Humana partner ADPP Guinea Bissau has been working to secure access to land titles for women in the Empada region, paving the way to improved food security and income generation, strengthening their ability to look after themselves and their families. Women account for nearly half of the world’s small holder farmers in developing countries. 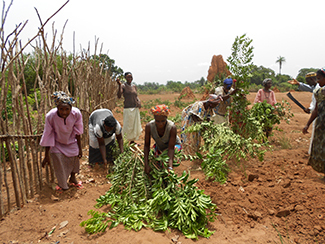 In Guinea Bissau, they are the primary labour force for the cultivation and harvesting of the country’s principal crop, cashew, and are also primarily in charge of horticultural activities for household consumption. However, currently, women are not permitted to inherit or own property under laws implemented while the country was still a Portuguese colony. The Lei de Terra (Land Law) is currently being reformed, however the need for women to be included in land titles is urgent if the country wishes to achieve inclusive and sustainable growth. Research suggests that when women own the land they till, families tend to be better fed, better educated, and generally healthier. Daughters tend to marry at an older age and wives tend to suffer less incidents of domestic violence. At a household and regional level, food security and economic development increase when women are included. 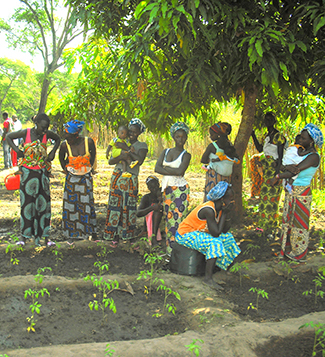 Last year, ADPP Guinea Bissau implemented a 11 month-long initiative to ensure that women are included as co-owners of land with the support of NEPAD and the Spanish Fund for African Women’s Empowerment in the country’s Empada region. The initiative involved the registration of land for 10 existing Farmers Clubs, of which 80% of members are women. Women were first registered in censuses in order to then allow them to register as co-owners of land. The project registered community gardens, where the club members learn improved techniques, under the names of all the members of each club. 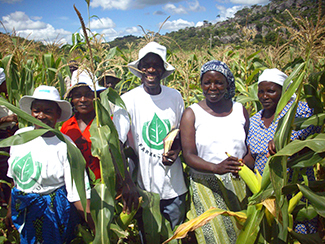 Although it’s a complicated process, the Farmers Club model encourages clubs to register as cooperatives when they reach a certain level of production and have secure market connections. When and if the clubs in Empada decide to formalize their activities, the women will also become official business owners and their rights to decision making and profits will be further guaranteed.